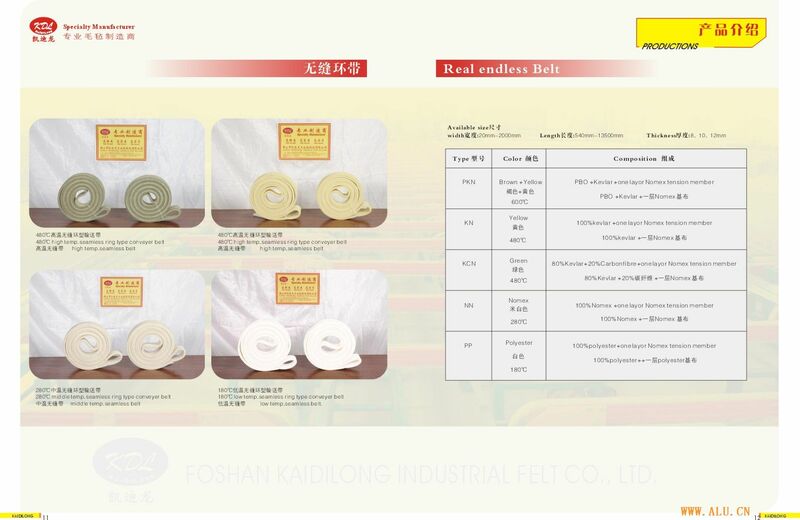 Foshan Kaidilong Industrial Felt Co.,Ltd. KaiDiLong is the first and sole professional manufacturer that possesses an integrated set of production equipment! KaiDiLong, FoShan Industrial Felt Co., Ltd was founded in 2003. It’s one of the most professional aluminum heat processing felt products enterprises. Since the establishment, the company has always based on the high lever of the market. The company imported several advanced sets of automatic NC production lines and testing equipments from Germany the "Zedillo", "Austria", "Feller" and "ShouXing" from Taiwan. Until now, it is the first and sole professional manufacturer that possesses an integrated set of production equipment. Aiming at the transportation, transfer, protection and other techs after the aluminum extrusion and heat processing, the company made relevant technical alternation. The company organized the design group composed of a number of senior engineers engaged in aluminum production technology, engineers engaged in manufacturing non-woven fabrics and mechanical design engineer to design, research and manufacture. Our products include: seamless conveyer belt, low and high temperature roller, flat pad, spacing felt cover, aluminum scratchproof bar, etc. The company produces "high-intensity, high-density, high-quality" products in the leading market. For holding "Create brand, Stress service" as principle, we won high recognition and trust of clients. The director of the company leads directly the sales elite. The product sales network is across the whole country and other places like Southeast Asia and the EU region. The whole company staffs take the enterprise spirit "profession, concentration, absorbed", Try to pursue the perfection, develop constantly for new clients. Relying on advanced production equipments, superb production craft, high quality products and sincere service attitude, we establish long-term, stable, friendly and cooperative relations with all customers. The successes of KaiDiLong all need unfailing supporting of friends in all circles.